80 Litre standard wire trolley with flip out baby seat, coloured handle, bag hook and 100mm diameter wheels. The 80L small wire supermarket trolley is the smallest we do with a flip out baby seat as standard. 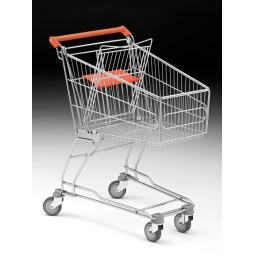 This is a popular shopping trolley in the convenience retail sector and one we recommend to retailers as it gives an extra capacity to the ever popular 60L trolley with only small increases on width and length. 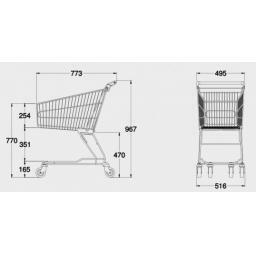 If you need advice on trolley size to pleas call or email and our experienced sales team will be able to help you made the right decision.